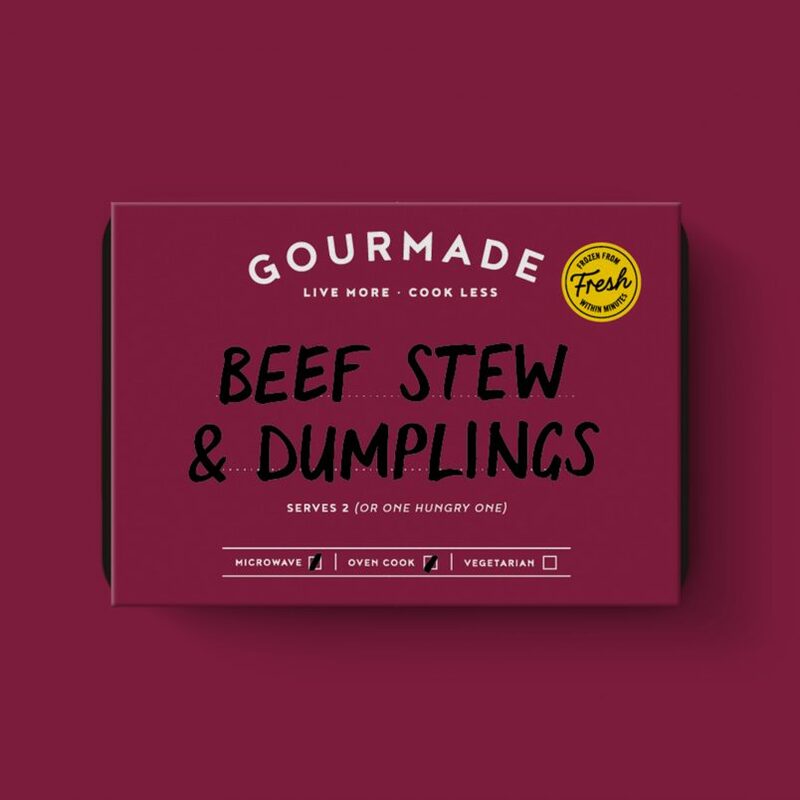 The ‘ups’ of making your own beef stew and dumplings can also become the ‘downs’… slow cooking for 3 hours fills your home with the hearty aromas of autumnal comfort: delightful if you’re not planning to leave a load of freshly laundered clothes hanging around the house to dry while you’re out! 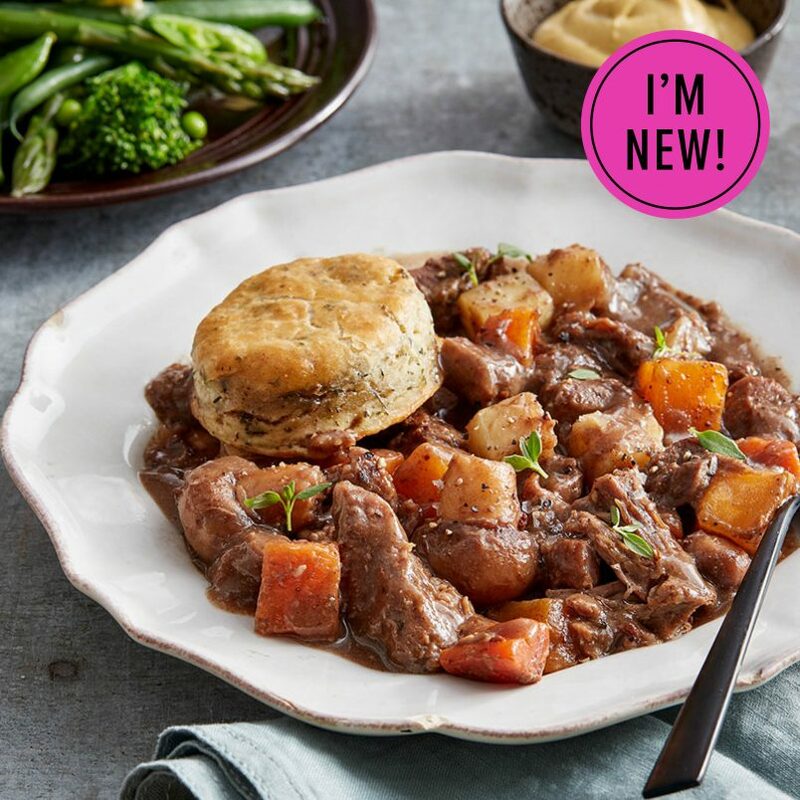 And after all your early morning preps, your beef stew will be ready to tuck into the moment you set foot in the door – providing there’s no change of plan or hold ups on your way home! Perhaps everyone else has smooth running lives where nothing ever slips in or out of place! But I like a few surprises… and that is why we’re here to help with our meaty slow-cooked stew of succulent British beef and root vegetables topped with fluffy herb dumplings – a classic British dish perfect to satisfy any cravings… stress-free enjoyment!… enjoy! Cooked Beef (25%), Water, Parsley & Herb Dumpling (14%) [Wheat Flour, Water, Vegetable Suet (Vegetable Fat Blend (Palm, Rapeseed, Sunflower Oil), Wheat Flour), Vegetable Shortening (Rapeseed Oil, Palm Oil, Palm Stearin), Egg, Parsley, Raising Agents (Disodium diphosphate, Sodium bicarbonate), Salt, Sage, Thyme, Cracked Black Pepper], Carrots, Swede, Parsnips, Red Wine, Mushrooms, Onions, Modified Maize Starch, Beef Stock [Beef, Rehydrated Potato, Salt, Molasses, Caramelised Sugar Syrup, Dried Onion, Black Pepper], Rapeseed Oil, Garlic Puree, Rosemary, Thyme, Salt, Cracked Black Pepper, Ground Bay, Ground Black Pepper. Cooked Beef (25%), Water, Parsley & Herb Dumpling (14%) [Wheat Flour, Water, Vegetable Suet (Vegetable Fat Blend (Palm, Rapeseed, Sunflower Oil), Wheat Flour), Vegetable Shortening (Rapeseed Oil, Palm Oil, Palm Stearin), Egg, Parsley, Raising Agents (Disodiun diphosphate, Sodium bicarbonate),Salt, Sage, Thyme, Cracked Black Pepper], Carrots, Swede, Parsnips, Red Wine, Mushrooms, Onions, Modified Maize Starch, Beef Stock [Beef, Rehydrated Potato, Salt, Molasses, Caramelised Sugar Syrup, Dried Onion, Black Pepper], Rapeseed Oil, Garlic Puree, Rosemary, Thyme, Salt, Cracked Black Pepper, Ground Bay, Ground Black Pepper.